Seeing many creationists victories and seeing many Darwinist defeats is very satisfying. King David wrote about God preparing a table in the presence of enemies. I recently saw an excellent sermon about how Christians should pursue heaven with greater intensity than Olympic athletes pursue gold medals. The Apostle Paul wrote: "Do you not know that those who run in a race all run, but only one receives the prize? Run in such a way that you may win." Spanning the globe to bring you the constant variety of sports. The thrill of victory and the agony of defeat. The human drama of athletic competition. This is ABC's Wide World of Sports. Our group's Question Evolution! blog has certainly spanned the globe to bring you the constant variety of creationists' glorious victories and evolutionists crushing defeats! This week our Question Evolution! Campaign had a number of important breakthroughs. 5. Increase our ability to educate the public about the evidence and arguments for the Bible and Christianity. 6. Enhance our ability to form strategic alliances. We plan on sharing the 6 things above with you as things develop. We believe they will help grow biblical creationism in the Western World and in the world at large. It is certainly an exciting time to be a creationists as we have a considerable amount of very positive trends working in our favor. On the other hand, Richard Dawkins and other evolutionists are being dogged with defeat after defeat. 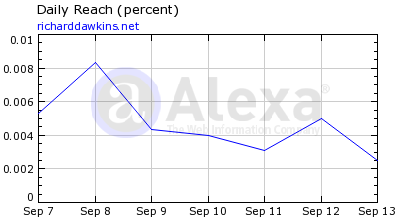 For example, Dawkins has had a bad 2 years, a bad month and the last few days haven't been good to him either as can be seen by the traffic graphs below. You can click on each graph below to see the graphs more clearly. Also, in recent years evolutionism and atheism have had a number of embarrassing defeats while Bible believers and creationists continue to go from victory to victory.